Personalised jigsaw puzzles are an ideal photo gift for any occasion! If you are looking for personalised gift, you are in the right place! Personalised jigsaw puzzles make perfect gifts for all your friends and family. To make a personalised jigsaw puzzle, you only need to upload a picture and our team will create stunning personalised jigsaw puzzle from it. 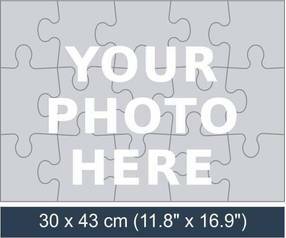 At PuzzlesPrint, you can easily create the perfect photo gift: a personalised jigsaw puzzle! Each of our puzzles comes with different piece amount, so you can choose your own difficulty level. 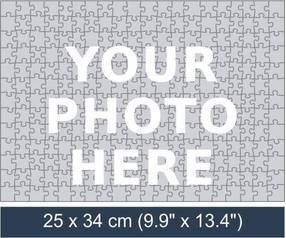 To make your own personalised picture jigsaw puzzle, select jigsaw size and upload your picture! What is a personalised jigsaw puzzle? It is a custom made jigsaw puzzle created from your own choice of photo. Over the years technology has developed to a level where you can make your own photo puzzle, just like the one you can buy in a toy store or supermarket, the only difference will be that the puzzle will be made with your selected picture. You can make your own photo puzzle! You have complete freedom to decide how you want your picture puzzle to look by choosing the photo and size, PuzzlesPrint offers 12 standard jigsaw puzzle sizes for you to choose from, giving you complete control over how your puzzle will be made - your own photo and your selected size. 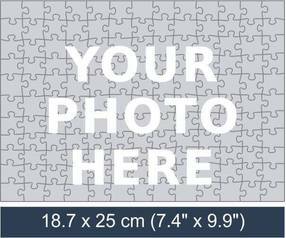 Your custom made puzzle will be delivered directly to you, wherever is convenient. Why should I make a personalised puzzle? First of all if you are a fan of jigsaw puzzles then it will be much more interesting to solve a puzzle that is made from your own choice of image. The picture can be a family photo, beautiful landscape, pet or a snapshot from your holiday trip, it is up to you to select a picture that you desire to be made into a jigsaw puzzle. 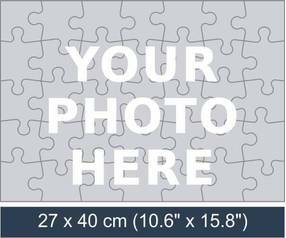 Another reason to create a personalised puzzle is if your friend, colleague or a relative has an upcoming birthday, or any other special occasion. Photo puzzles makes a great gift, because they allow you to capture an important moment of someone’s life. PuzzlesPrint will take care of making a high quality picture puzzle gift, which will be packed in a beautiful customised box with your selected photo on the top, also if you want we can deliver the custom made jigsaw puzzle directly to the recipients address. In addition, customised jigsaw puzzles have proved to be great for fund raisers or for photographers to show their artwork in a different way. Of course there are a huge variety of ways to use our products, the limit is your imagination, and those mentioned above are simply the most popular examples of why people choose to create picture puzzle instead of other personalised products.